The folks in Plaza Midwood are sooo interesting! 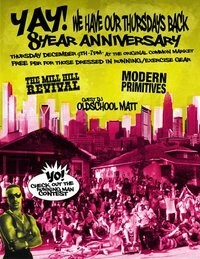 Found this event on Facebook this morning: COMMON MARKET 8TH ANNIVERSARY BYE BYE JOGGERS PARTY!!!! Not only is Common Market apparently celebrating its 8-year anniversary tonight, but the "PBR crowd" is celebrating the leaving of the "joggers." Apparently these two groups of folks clashed a bit, and the "joggers" have left to find a new place to congregate. Needless to say, I'm sure a member of the "PBR crowd" posted the event invitation. Haha. Celebrating 8 solid years of the coolest place to hang out in the neighborhood. Plus the joggers are officially gone forever for complaining about the "PBR crowd" so lets show Tom and Blake some gratitude by coming out to party. Also there's a free show featuring Bart Lattimore and the Mill Hill Revival, Modern Primitives, and DJ Matt. Dress up like a jogger and get a FREE TALLBOY OF PBR!!!!! Common Market is located at 2007 Commonwealth Ave.